The Base Incentive forms the main commission structure when applied to a Service Plan. Defined within the Base Incentive is the commission amount received from the Service Provider, and the commission amount paid to salespeople. You may specify different commission amounts for each activation type. Once a specific Base Incentive is created, you may apply it to one or many service plans. To access Base Incentives from the menu bar of the main TeleTracker Online screen, click Master Files, then Service Provider. Select the appropriate Service Provider and click Open. Click Incentives on the left side column menu. Click . To create a new Base Incentive, click the Add button. To edit/open an existing Base Incentive, select the appropriate Base and click Edit. Description : The Description field defines the Base Incentive. This description applies only to the Service Provider and will not be printed on the Invoice. Start/End Dates : Assign the appropriate Start/End dates for which this Base Incentive is valid. If the commission amounts change for this Base Incentive, input the correct End Date for the last date entry. 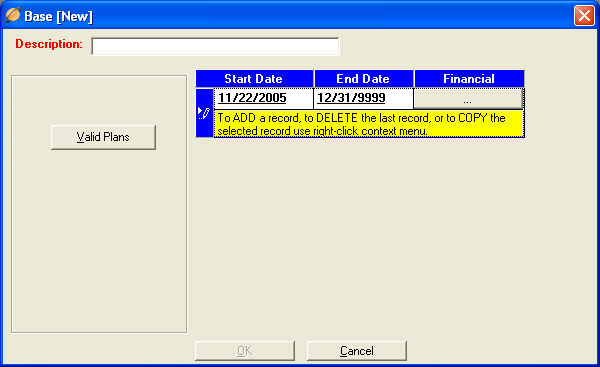 Create a new valid date range by right-clicking the context menu. Select Add. Each date range will have it's own Financial button containing an individual commission structure. Valid Plans : Click the Valid Plans button and select the appropriate plans for the Base Incentive. 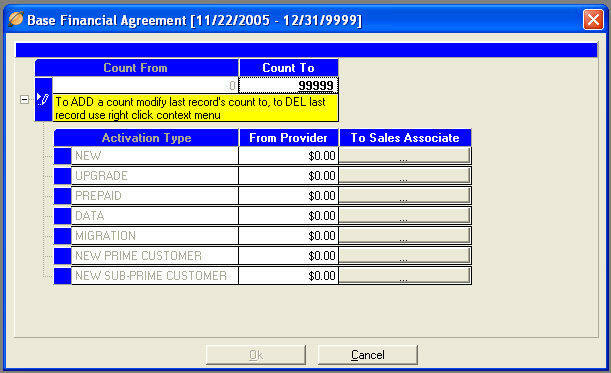 You can also select the appropriate Base Incentive in the Service Plan Terms window. The Financial Button contains the Tier and Commission structure of the Base Incentive. Clicking the Financial Button will begin the process of defining Tier and commission amounts for each activation type. Count From/Count To : These two fields define the individual commission Tiers. Each individual range of numbers will contain it's own sub-menu consisting of Activation Type, From Provider, and Sales Associate button. Click the [+] next to the desired range to view the sub-menu. From Provider : For the specified Activation Type, input the Receivable Commission amount from the Service Provider. Click this button to specify the commission amount given to the salesperson.